Earlier this year, I was contacted by Laurence King Publishing about reviewing a copy of Drape Drape by Hisako Sato, which was translated into English just last year. I'd heard about this series before, and to be perfectly frank, I was pretty doubtful if the looks would work for me. I know a lot of sewing bloggers I love tend to love these patterns, though, so I figured I should be fair and give it a try. I mean, don't knock what you haven't tried, right? I went ahead and requested a copy. When it arrived, I was still dubious, but also intrigued by the unusual pattern pieces. This book doesn't actually teach draping, but it does give one an idea of the kinds of cuts that are required to give certain looks. 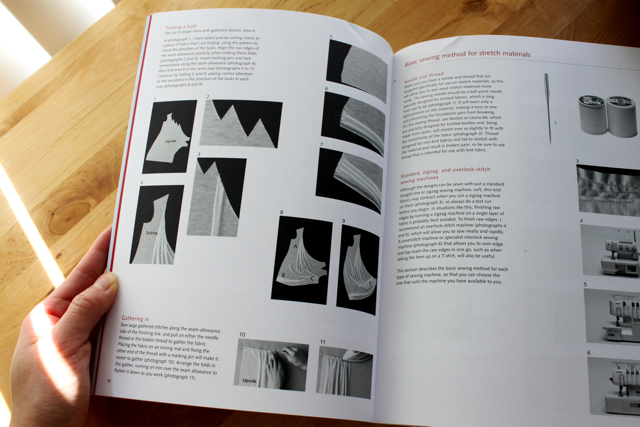 Pretty pretty intro pictures showing how to sew the drapes! See what I mean about the style being a bit different from my usual? I'm not sure when this would ever be socially acceptable to wear in public. On the other hand, your whole dress is a pocket? I highlighted my pattern pieces so that I would know what to trace. It reminded me of those puzzles you do in kindergarten where you have to figure out which balloon belongs to which child, or which snake head goes with which tail, etc., and there's a big tangle where you need to find and follow the appropriate lines. Since I've been busy working on making Elaine's wedding dress, I wanted to sew an "easy" pattern from the book, preferably one that didn't involve too many pattern pieces. I mean, check out the line explosion on the pattern sheet! Now, those of you who have had the questionable good fortune of practicing tracing from BurdaStyle magazines are probably all pshhh that's nothing, but I come from the school of just-cut-out-the-pattern-even-if-it's-vintage, and I've never traced a pattern before (please don't lynch me, vintage pattern collectors), so I was pretty daunted by all the lines. They're all the same color and the same solid lines, with both the seam allowance and the stitching line shown, which made it all that much more difficult to figure out which line I wanted. 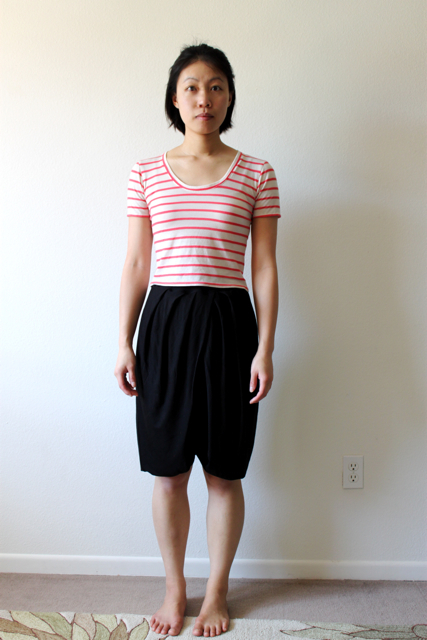 * In the end, I selected the very first outfit as being the simplest to trace: the Loose Drape Top and the Tuck Drape Pants. My initial consultation of the sizing chart puts me at a size L (the book provides patterns for bust sizes 30.5-35.5"), but after reading several reviews that all commented on the ease in these patterns, I decided to trace and cut the small. It's a good thing I did, too, since the top I cut out is -- I kid you not -- literally too large to stay on me. Photos would have been me standing in my unmentionables with a puddle of fabric at my feet. And I have really broad shoulders, too. I'm afraid of what it would've looked like had I cut out the recommended size! Even after taking in the side seams by four inches (!) on each side, it's still sack-like, which is more or less how it looks on the model, so I guess in answering the PR question "Did it look like the photo on the pattern envelope once you were done sewing with it?" I would have to say that yes, unfortunately, it did. I threw the unfinished top into my UFO pile, where Walnut didn't even deign to sit on it. I'll harvest the fabric later for another, more fitted, top. In the meantime, I'm pretty discouraged about cowl-neck tops on me (especially after my previous fail in that department). After my initial Drape Drape disappointment, I turned to the pants, hoping that they would work out better. 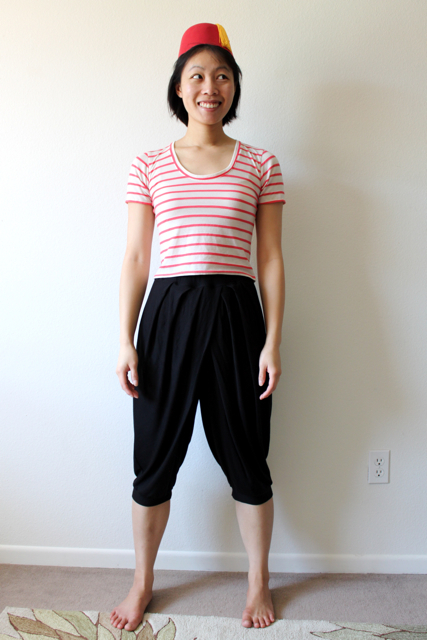 I love a good pair of comfy knit pants, so I went about making them in a basic black jersey. 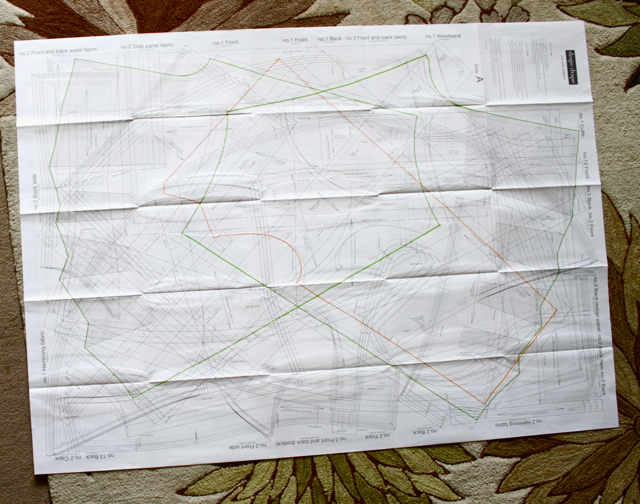 Cutting, pleating, and sewing went pretty quickly, although figuring out the diagrams took some getting used to. The instructions are concise at best, which may or may not be your thing, depending on how experienced you are. I liked them as they were, but then I also rarely consult instructions when sewing with Big 4 patterns. 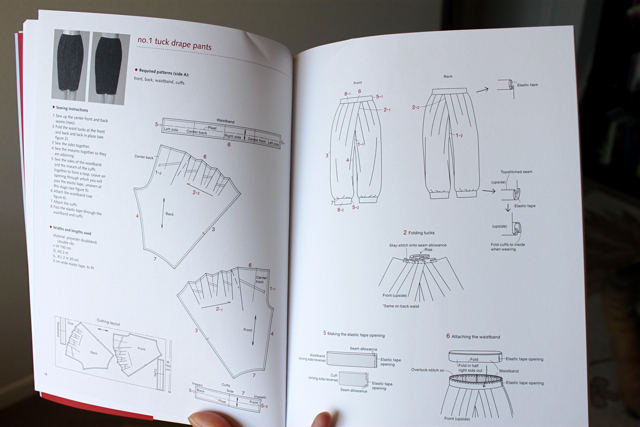 Here's all of two pages in the book dedicated to sewing up this pair of pants. Love the lovely simple line drawings. I decided to imitate the photography of the book and take pictures in front of a white wall. Oh hey, look, I finally took down the Door to Moria! 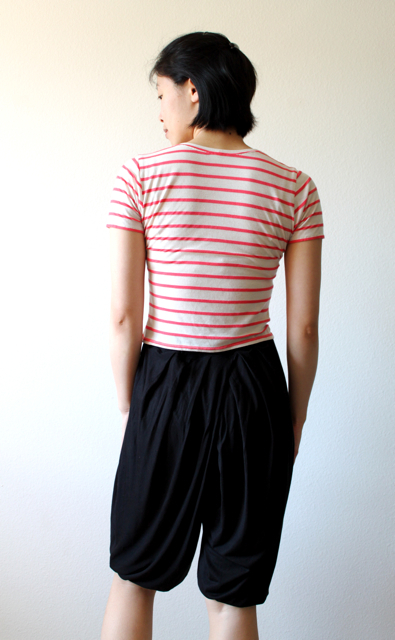 Back view: wrinkly mess because who irons jersey knit? Since I don't have a serger, finishing the waistband seam was pretty difficult. 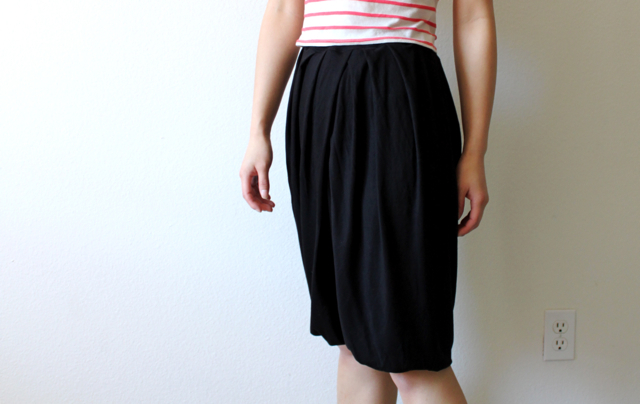 I think mine looks like crap, and the thickness of the pleats (eight layers in some places!) means that once the elastic is inserted, it doesn't lie flat or gather properly, leaving these huge weird wavy ripples instead. Trying to topstitch the seam allowance to help hold it down didn't work, either. I'm not sure how to fix that issue, but in the meantime, I just won't be showing the waistband when I wear these pants, which is fine since almost all of my shirts are long enough to cover the waist and then some. Because of the amount of fabric gathered into the waistband, these pants have tons of ease in the hips, making them supremely comfortable. I was right, though, in my initial assessment that these aren't really my style. I don't think I'll ever wear them out of the house unless it's laundry day. I will say that they're perfect for sewing in, though, since the cropped length means it's easy to get down on the floor for cutting, and the elastic waistband makes it easy to slip on and off for fitting as I sew. Really getting into imitating the book model's poses: standing stiffly, looking unamused. 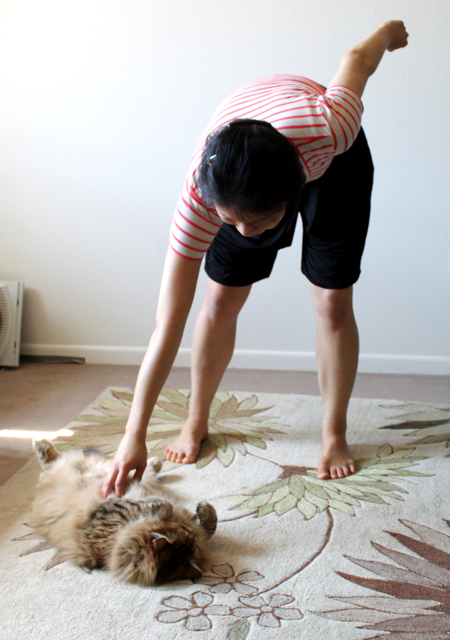 Instead of bending over and fiddling with a chair, I bent over to pet Walnut. I mean, how could I not want to scritch this face? Irresistable, I tell you. Yes, I do have a spare fez in my costume trunk. I can't believe you compared me to a monkey, Mom. That is seriously demeaning. 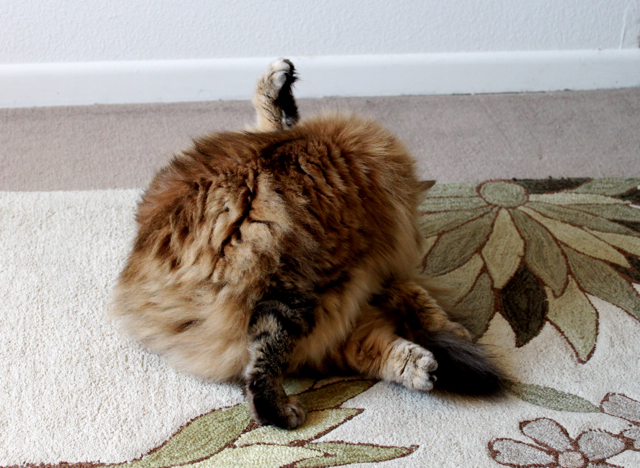 Here's what I think of your comparison. All of this sounds like I'm not a fan of Drape Drape, but before LK Publishing comes to get me, just wait for tomorrow! I was so bummed that I decided to ignore the sewing queue and try another pattern from the book, and that one worked out much better. Stay tuned! *This is why I totally appreciate that Mari is asking for sewists' opinions for her new pattern company, Disparate Disciplines. Go check out the Kickstarter if you haven't already! hahahah love this post and your cat! Now, the question is: are you going to wear this pants after all the funny pictures? Aw, they're cute! Perfect for a sewing day at home. I like the drape drape patterns on other people, but they're not really my style either. Thanks for showing us Walnut's involvement - he's the cutest! I love that even when things don't go according to plan, your posts are still entertainingly hilarious. 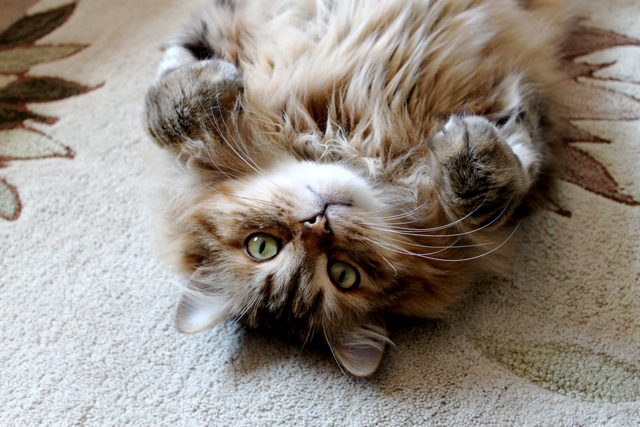 And Walnut is adorable. This post had me grinning! The pattern sheet kind of scares the crap out of me! You can trace patterns with a spikey wheel with the pattern placed on top of regular paper. Or you can use tracing paper - this vellum kind is my favorite because you can just place it over the pattern and see right through to trace with a pencil. 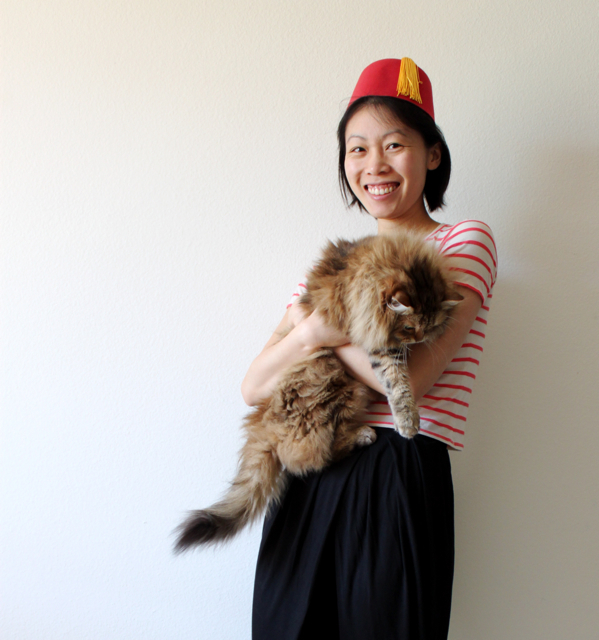 Haha, love the fez! I've often thought that Japanese pattern books have great photography and a very defined style that is not at all my style. Oh I needed a laugh today and you generously supplied it. Happy to hear that even if the look isn't your style you still found good things to say about the pattern. As a general rule I sew in my pj's no matter what the time of day because it is way easier to change in and out of elastic waistband pants than fiddling around with buttons and zips. Bahahahaha! 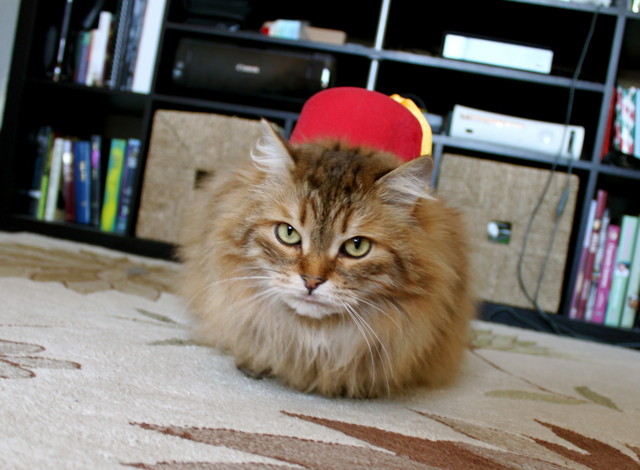 Love the fez, especially on Walnut! Interesting pictures of the pocket dress but definitely not something I would ever feel comfortable wearing. I own two of the pattern magic books, and love them- in a completely non practical way, because they are so interesting from a technical point of view but the clothes are mostly out-there. 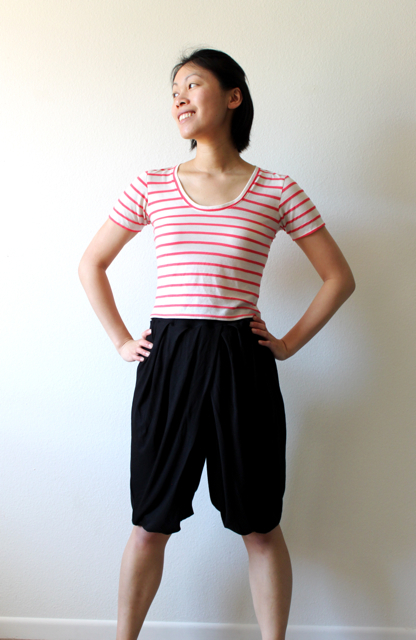 Your aladdin trousers are out-there, but awesome, and your post is terrific. I am keen to see what you make next. Wow, I've been hoping that someone would make these so I could see them on and you did a great job! I love them. 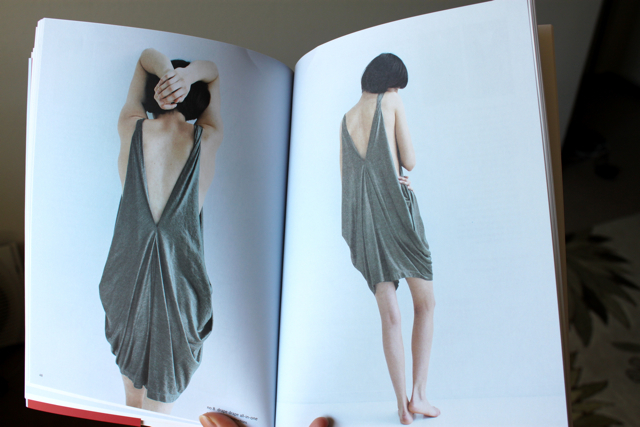 I've been debating on which Drape Drape volume to buy baased on how many patterns I love in each book. This adds one to that one. I can see wearing those in summer with a loose linen shirt and ballet flats or espadrille wedges. Thanks. I love that you have random hats to accessorize your makes - it makes me want to raid my drama club closet for my next photo shoot :) Also, I never trace patterns either ---- duh, duh, duh. It's nice to know I am not alone - lol. Can't wait to see what else you made! I had been looking to make something very similar and now I know where to find the pattern! Not sure if I like the other looks in the book though. It's weird that the one thing I'd like would be harem pants. I've never even tried on a pair, but suddenly I have the urge to make and wear them. I do like them! Maybe not everyone could wear them, but even though they are not your style, they do look cute on you. Interesting! I've been drooling over the covers of these books for awhile so it's nice to see what's inside and how they work up in real life. I can't see all the ripplyness in the shorts you were talking about. They look pretty cute to me with the bands tucked up. ...i kind of want those pants now. I actually think you're pulling these pants off! I mean, they work on you.